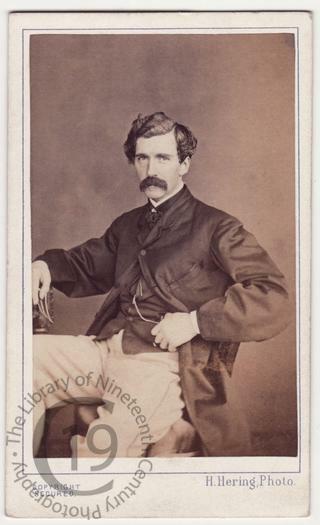 A carte-de-visite portrait of the British actor Edward Askew Sothern (1826-1881). The son of a ship-owner, Sothern was born in Liverpool on 1 April 1826. He initially worked as a clerk in a shipbroker’s office. His first appearance on stage was in 1849 at the St Helier Theatre in Jersey under the name of Douglas Stuart. His first American appearance was in September 1852 at the National Theatre, Boston. He was a member of Wallack’s company in New York from 9 September 1854, at which point in his career he changed his name to Sothern. He played many light comedies at Laura Keene’s theatre in New York. It was here on 12 May 1858 that he first appeared in the role for which he is best remembered, Lord Dundreary, in Tom Taylor’s Our American Cousin, a farcical comedy whose plot is based around the introduction of an awkward, boorish American to his aristocratic English relations. Sothern’s character became famous for his exaggerated sideburns (‘Dundreary whiskers’) and for his ‘Dundrearyisms’, twisted aphorisms such as ‘birds of a feather gather no moss.' The play’s most notorious performance was on 14 April 1865 at Ford’s Theatre, Washington DC during which Lincoln was assassinated by John Wilkes Booth. Sothern first appeared as Dundreary in London at the Haymarket Theatre on 11 November 1861, where he played the part for 496 performances. His first Paris outing as Lord Dundreary was on 8 July 1867. At the height of his career Sothern was earning a phenomenal £235 a week, and though he played many other roles during his career, he will always be remembered as Lord Dundreary. Sothern died on 21 January 1881 at 1 Vere Street, Cavendish Square, London and was buried on 27 January at Southampton Cemetery. Photographed by Henry Hering of 137, Regent Street, London.